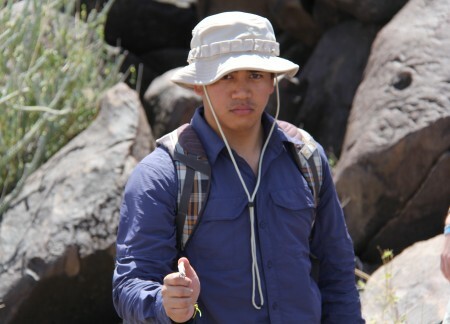 Because we didn’t get enough time in the sun the previous week, a group of students decided to join Dr. Dino Martins on a hike through the Napadet Hills on our Sunday off from coursework. 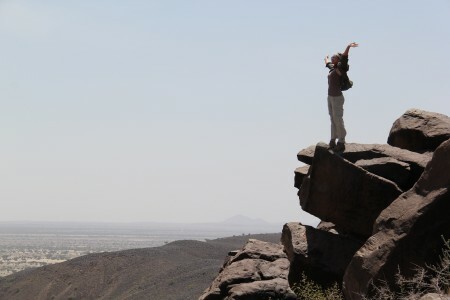 The excursion promised to be a warm 15km topped with a climb up the rocky hills. 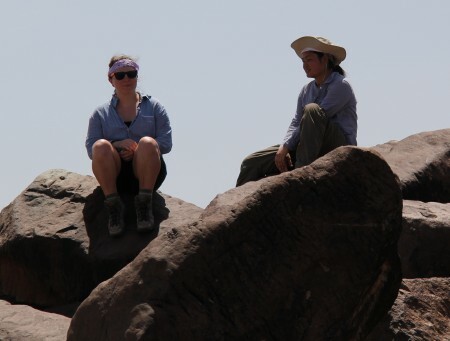 The reward would be an expansive view of the desert, river, and fossiliferous badlands. 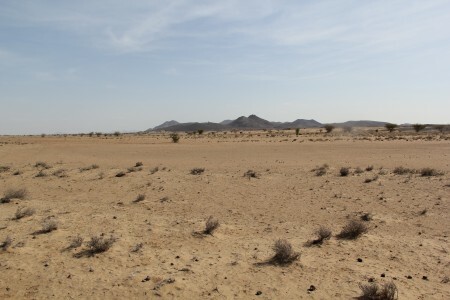 The Napadet Hills, dimly visible from camp on a clear day, arise from the flat expanse of the desert and scrub we’ve all grown accustomed to. We set out early Sunday morning, packed onto padded benches bolted to the bed of a Land Rover. 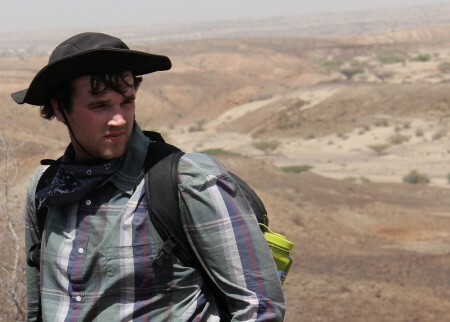 We motored across the desert, using bandanas to protect our faces from the dust kicked up by the truck. 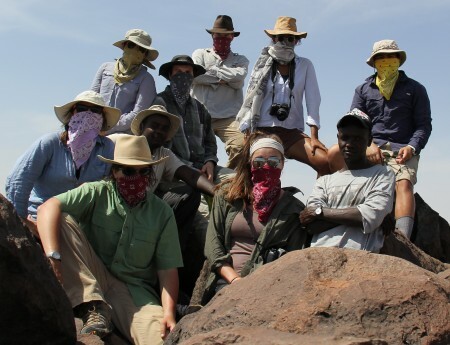 We looked like a gang of train robbers trying to get the jump on the Pinkertons. 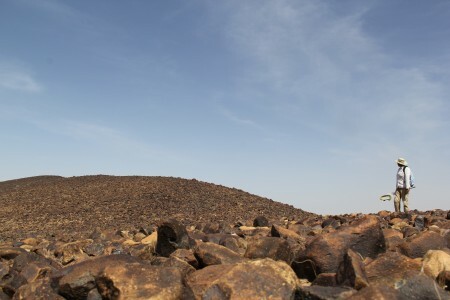 The hills loom dramatically over the flat expanse of desert at their feet, a vast outcrop of volcanic basalt providing a vantage point to survey the surrounding grassland. Next week we’ll begin the Geology course module with Dr. Craig Feibel and we’ll all understand the history of these volcanic hills a little better. Tim makes the approach to the Napadet Hills. 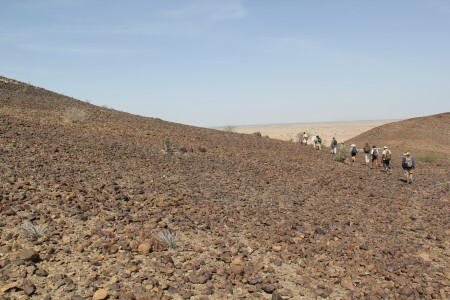 Once we hit the base of the outcrop, the substrate transformed from sand to the cobbles and boulders of basalt that built the hills. 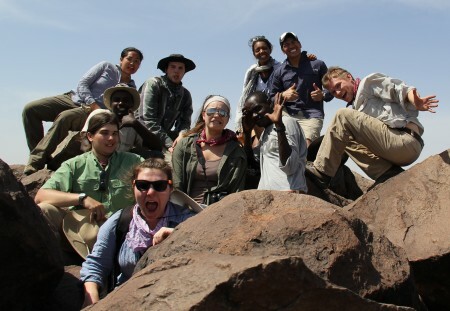 We scaled the first peak by climbing over massive blocks of rock or picking our path carefully over loose scree slopes. Rob checks on the rest of the hikers carefully picking their way up the loose slope. 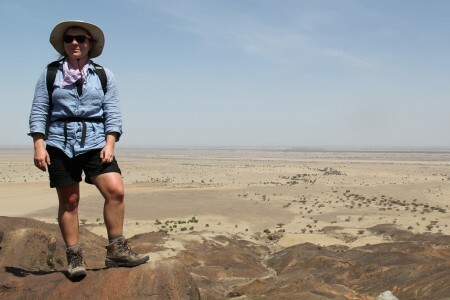 John takes in the expanding view of the open desert. 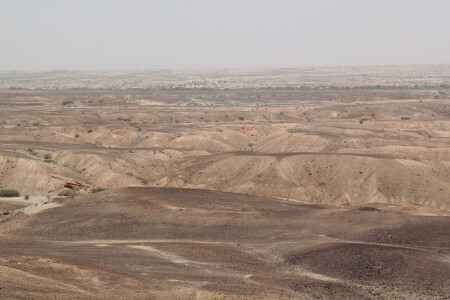 The badlands to the north of the hills. Fossils live out there. As promised, the view was well-worth the effort. Cory takes it all in from the top of the first peak. 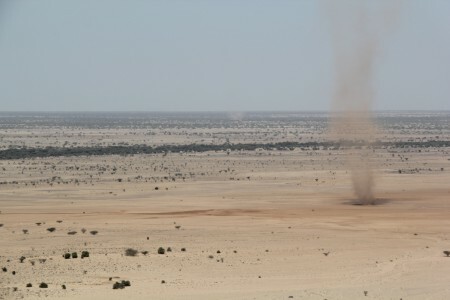 In the distance, we could watch dust devils spin across the flat pan of the desert. Closer to hand, scattered bones revealed few predators or insects disturb any carcass left on the slopes. A distant swirl of dust crossing the desert between the hills and the Land Rover. Timing is everything. Leanna and Holly admire the view while cooling down after the tough uphill slog. 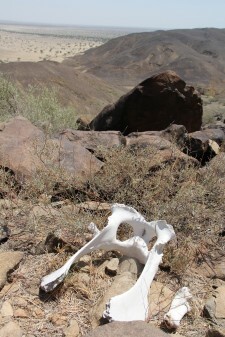 A camel skeleton was strewn across the saddle between two peaks. According to Dr. Martins, the remains have been lying in the spot for at least four years. The dispersal of bones and their slow breakdown make a perfect taphonomic experiment (taphonomy being the study of how remains break down and eventually enter the fossil record…but more on that in a few weeks) and an opportunity to learn a little more about mammalian herbivore morphology. The pelvis of an adult camel. The skeleton has been strewn across the slop for at least four years. Rob uses a modern goat mandible to illustrate typical bovid dentition...and to practice his Eastwood. 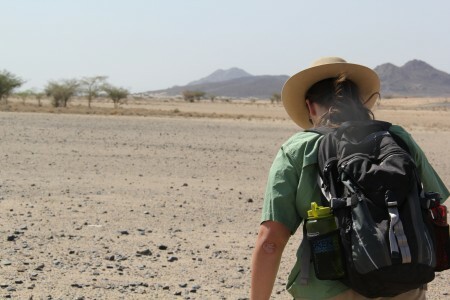 Upward we marched, lead by Dr. Martins with his ever-present net for capturing specimens, and Francis, our Turkana guide through the desert. 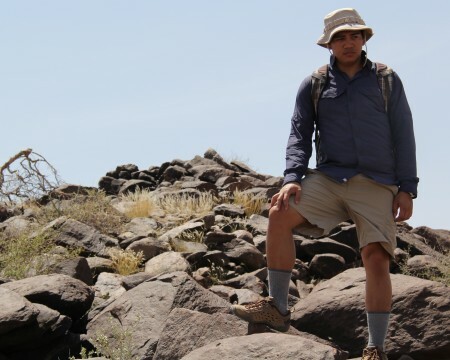 Dr. Dino Martins surveys the apparently barren landscape and manages to find an capture an incredible variety of insects living on the basaltic slops. 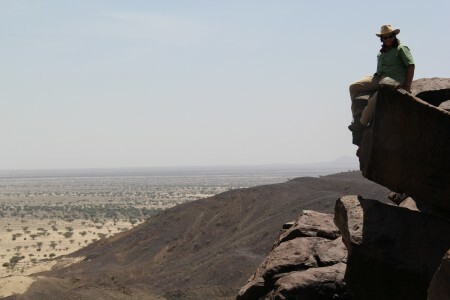 Francis takes in the view and points out the mountains we will be visiting in the future and the herdsmen’s camps at the base of the formation. Leanna, victorious, near the top of the second slope. Tim absorbs the uninterrupted view of our temporary home. 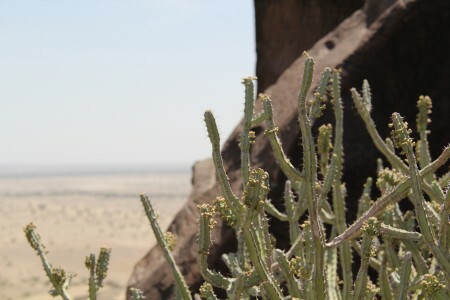 The desert adapted, cactus-like euphorbes cling to the exposed rock, an exhibition of adaptation in action. After lunch on the peak of on of the Napadet Hills, we turned downslope to hike back to the Land Rovers. On the way off the final slope, we took a detour through a series of gullies carved into the sandstone. 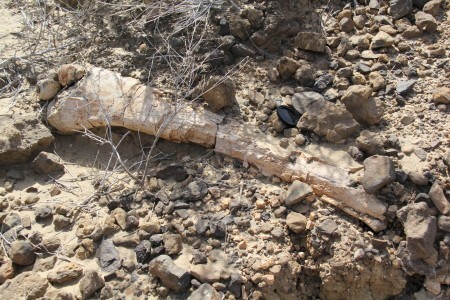 Fragments of bone littered the ground. Old bone. Fossilized crocodile scutes, and fragments of mammalian long bones. On our way across the cobbled slope to fossil-bearing rock. The rest of the hills. Someday we’ll come back and tackle them all. Dr. Martins and Francis announced there was an elephant in the area. We spread out to find its remains. Tim was the first to spot the massive leg bone nestled in the rock. 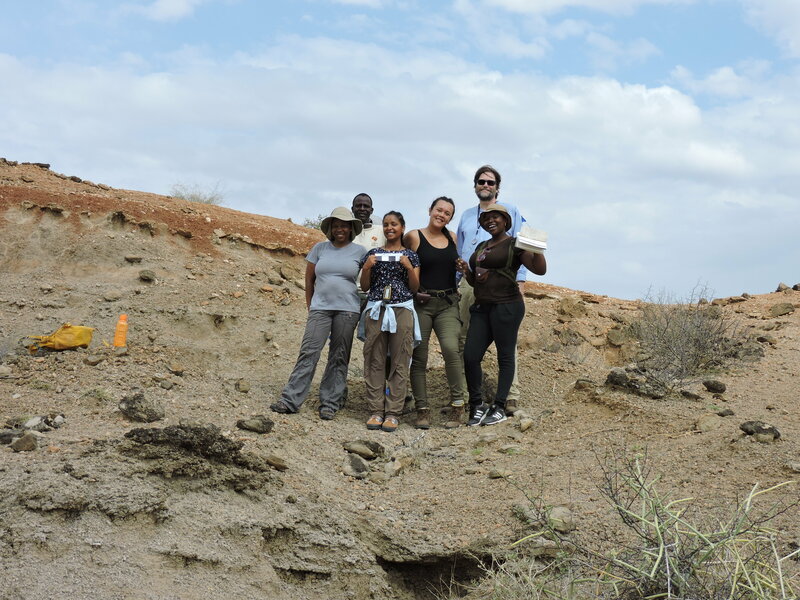 Nearby fragments of rhino teeth and horse molars conjured up a grassier, more verdant landscape 3.5 million years ago, supporting a variety of large mammals no longer found in the area. 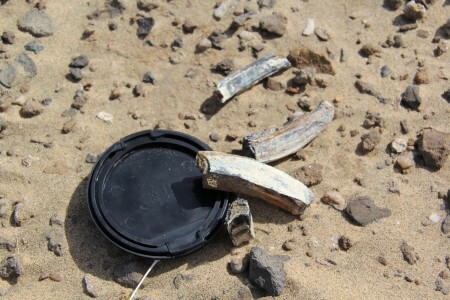 An elephant’s leg bone could be confused with a fossil tree trunk in most deposits (SLR lens cap for scale). 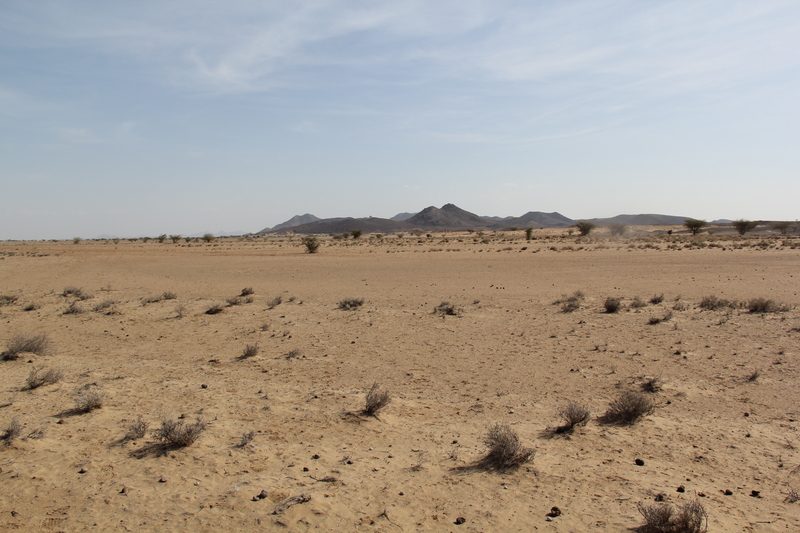 Isolated horse teeth suggests a lush, expansive grassland once blanketed the arid landscape. Horse feathers, on the other hand, are rarely fossilized. After a hot return across the flat, arid scrubland we guzzled down our water and sought a little shade and a light breeze before piling back into the truck to return to TBI. 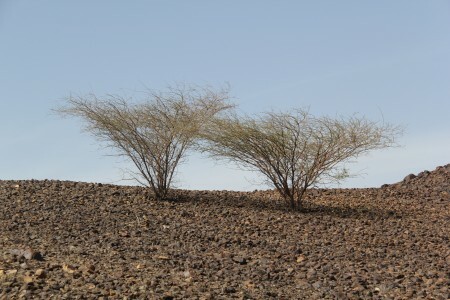 These acacias have managed to make a go of it on an apparently barren field of basaltic cobbles. Life finding a way. 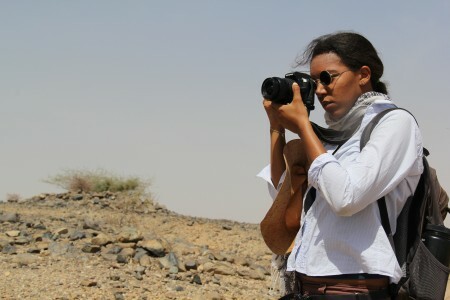 Ana is the other enthusiastic photographer in the crew. Some people may have had a lazy Sunday watching football. 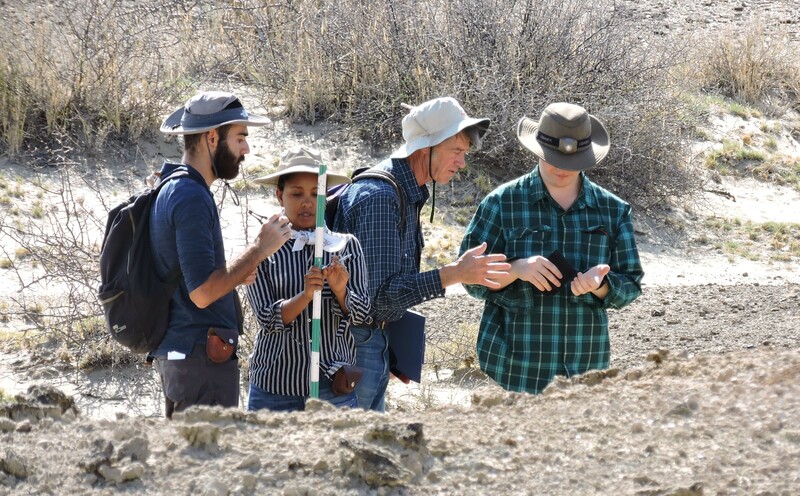 Our lazy Sunday took us above the desert for a sweeping view over the sand and back through time for a glimpse of the stories fossils and geology will reveal over the next few weeks.